This meal is your traditional (but vegan, of course!) 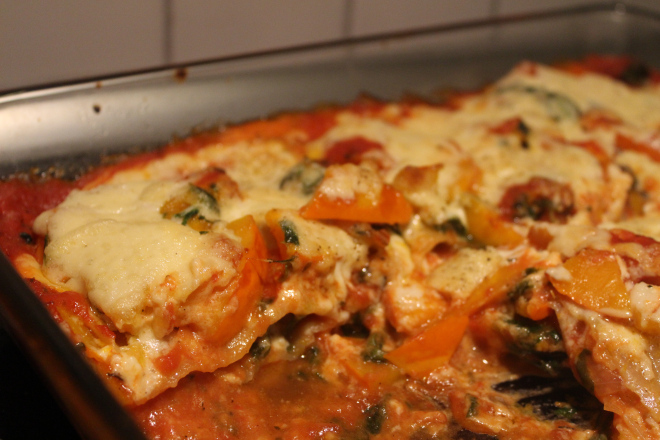 lasagna paired with Hokkaido pumpkin and spinach. 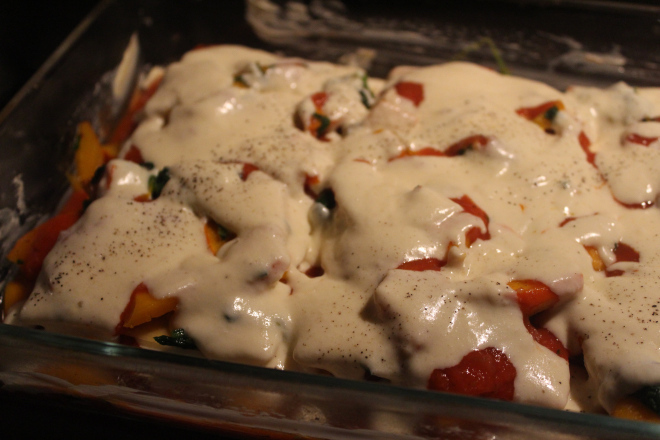 It is smothered by loads of béchamel sauce, so it’s not exactly healthy or low fat. But oh well, right? It’s a cat. Anyone can see that, right?! 1. Start with the sauce. Heat the oil in a heavy-bottomed sauce pan (medium heat), then add the onion and fry gently for a minute or two. Add the garlic, and turn the heat a little lower. Make sure you don’t burn the garlic. Thirty seconds or so later, add the spices. Almost immediately, add the flour and mix well. Add the remainder of the ingredients. Bring to a boil, then let simmer on low heat. It really is up to you for how long you leave your sauce like that, but it will only get better the longer it simmers. Simmer for at least 30 minutes. Taste for salt. 2. Preheat the oven to 350° Fahrenheit or 180° Celsius. 3. 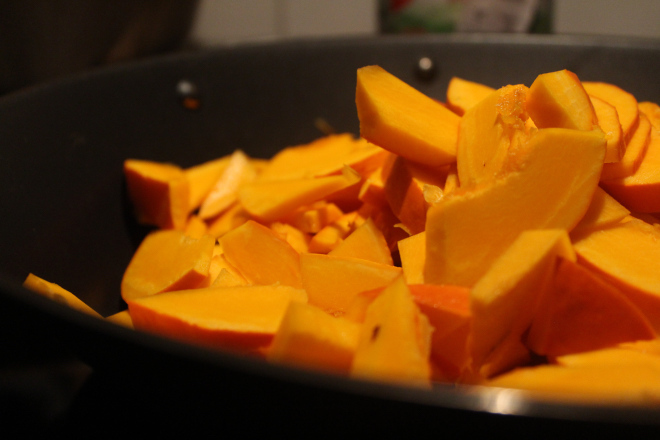 Meanwhile, heat the olive oil for the pumpkin in a frying pan. Add the pumpkin and rest of the ingredients. Gently fry for about 5-10 minutes, but on medium to low heat so it doesn’t get burned. 4. For the béchamel sauce, heat the margarine in a sauce pan (medium heat). Once it has melted, stir in the flour, mix well with an egg whip (or a fork). Let simmer for about a minute, then add salt and pepper. 5. Prepare the casserole dish by smearing a little bit of margarine on the bottom and sides of the dish. Then, add some tomato sauce so the bottom is covered. Add lasagna noodles, then put some of the pumpkin spinach mixture on top. Repeat until all ingredients are gone. 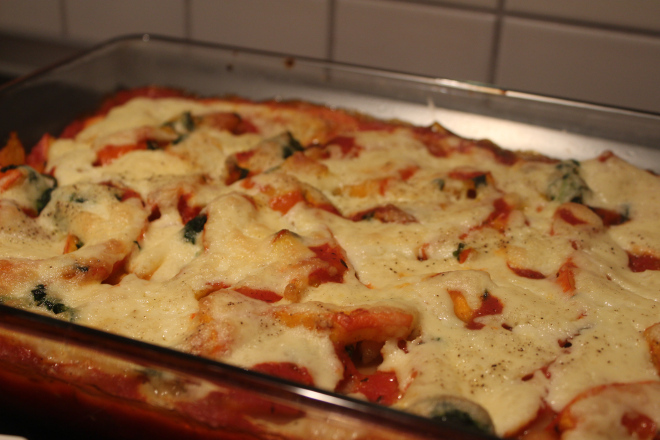 Ideally, your upper layer should be tomato sauce. Now, drizzle the béchamel sauce on top. Voila, you’re good to go. Put it in the oven and bake for 30-40 mins. 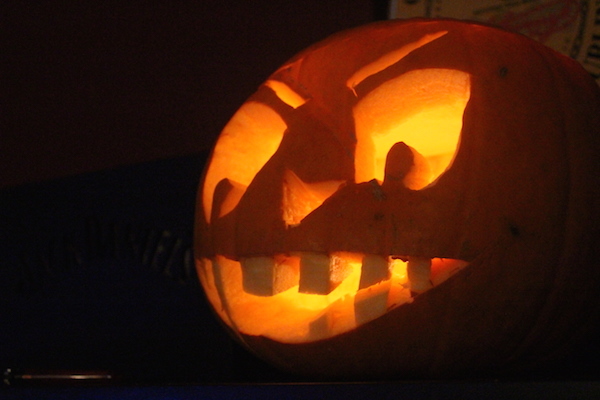 … and ready to be served!